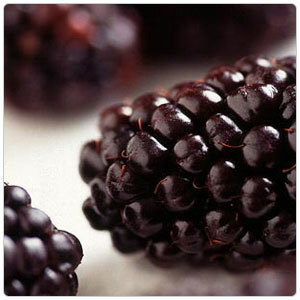 Blackberries are a purple-black fruit, oblong in shape, growing up to 1 1/2inches in length. They are semi-soft and, depending on variety, range from tart to sweet in flavor and usually contain seeds. Due to a wide range of growing areas, blackberries are available year round. True peak season is late spring through summer. Blackberries grown out of season are no match in flavor or texture for the seasonal farmers market type of berry. Blackberries are excellent for both eating out-of-hand, as well as cooking. Blackberries are best when fresh and ripe and used in fruit salads or as a topping for yogurt and both hot and cold cereals. Use in fruit tarts, ice creams and sorbet. Make blackberry jams and preserves as well as cobblers and crisps. Blackberries are a member of a group of well known berries-blueberries, raspberries, strawberries- that were once wild and are now widely cultivated in various locations on a year round basis. While there is a specific blackberry, the term is often used generically to refer to a wide range of bush berries that includes loganberries, boysenberries, Marion berries and ollalaberries.